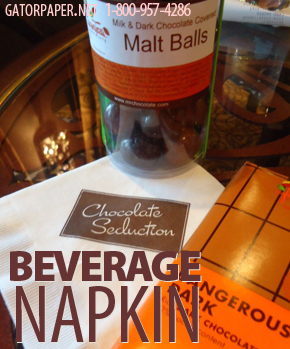 Beverage Napkins, the perfect napkin accent to any meal or drink. The 5” x 5”paper napkin is ideal for blotting while sipping coffee at a café, walking around a party, or enjoying a meal with friends. Need extra hand-blotting coverage? Simply open the cocktail napkin up and instantly it grows to a full size napkin. Gator Paper’s custom printed beverage napkins are available in a variety of colors in addition to white and Kraft brown. Select the perfect color to accent your logo! Our talented design team can review your logo and screen most all color logos on to the cocktail napkins for added brand recognition. Display your custom printed beverage napkins on retail countertops near check out, place them in to-go bags, or simply hand them out to customers. Your cocktail napkins will be carried around by customers, passed around to friends and your brand will be recognized by all! There’s no better way to promote your companies image than with our Custom Printed Beverage Napkins. The facial coin edge is the prefect flare! Our cocktail napkins are available for order in 1-ply, 2-ply or 3-ply tissue. The facial coin edge is the prefect flare to this unique paper napkin. Gator Paper’s minimum order is 12,000 napkins but with the recognition you’ll get, you’re sure to sell out quick! Review Gator Paper’s website or call the customer service department to discuss your needs and place the order that fits you best.